I can't wait to start reading all these great books. I still have a ton of library books to work on from the past two weeks too! Sooooo many books! 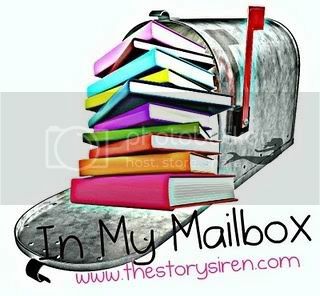 What's in your mailbox?? Leave a comment with a link to your blog! You got some great books this week. I have to go to the library more! The Ghost amd the Goth sounds good - I think I may have to get that. Just waiting for my copy of Desires of the Dead to arrive! Ooh neat! I've read a few of those and they were great! A few I've heard of but haven't read but heard they were good as well!! Wow! You got some fantastic books. I loved Unearthly and Across the Universe. Nevermore has been on my reading list for a while now so I can't wait to hear what you think of it! I've only read Unearthly and 13 Little Blue Envelopes and I liked them both !! I look forward to know what you think of them !! I want to read all the other books you got .. Lucky you !! All great picks, I got Nevermore a couple weeks ago, but haven't had time to read it. ps. i'm new to the blogging world and would love if you'd stop by my blog and take a look. Fab books! I loved The Ghost and the Goth. I just finished The Ghost and The Goth. It was cute and funny! Nevermore and Unearthly are in my TBR pile and I've read all the others. They are good as well, especially Across The Universe! Enjoy them. A great pile of books! They all look fab. Great books! I loved Across the Universe and Unearthly, and can't wait to read the others! I look forward to your reviews. Happy reading! I really liked The Ghost & The Goth! Nevermore is awesome. loved it to death. The ghost and the goth sounds good. AtU and 13 little envelopes I have on my shelf, and desires of the dead sounds good I loved the body finder so I need to read that one. I really liked Nevermore. Unearthly is FANTASTIC! I need to get going on Kimberly Derting's series as well as ATU. Great books! Great mailbox! I may be one of a few left that hasn't read Across the Universe! Awesome books you got this week. Across the Universe is really good. Hope you enjoy reading all your books. Great books! Across the Universe is fantastic!! I loved Unearthly and just recently picked up The Body Finder looks like you got a lot of great stuff! I enjoyed Ghost and the Goth and Unearthly and hope you do too. Fabulous books! I've heard awesome things about Nevermore and The Ghost and The Goth was a fun read.